Step right up, empty your pockets and get ready to shake hands with the original one armed bandit: Triple Riches Slots O'Jackpots Slot Machine! So hot it's cool and so cool it's on fire; when baby needs a new pair of shoes...BET BIG and get ready for Slots O' Jackpots! Level up in the brand new Gambling Skill! Play for Low Stakes (§50 Buy-In), Medium Stakes (§100 Buy-In), High Stakes (§300 Buy-In) or Lucky Coin stakes (equivalent to §1500 Buy-In)! Evil, Computer Whiz Sims, or Sims with a high enough skill in Logic or Handiness can Hack the Slot Machine to turn the odds in their favor. Technophobe Sims can Sabotage the Slot Machine to make other Sims lose more often. Sims that are Watched while gamble can get Distracted, Annoyed, or they may even get an Ego Boost! 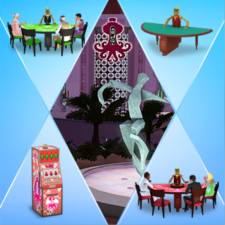 Place Slot Machines on your home lot and make Simoleons for your family when visitors play! 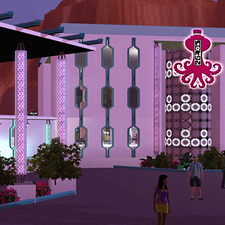 Place the Slot Machine on Community Lots and build yourself a casino! Slot Machine Includes additional functionality when the Wishing Well is installed in your game: Use a Lucky Coin that you steal from the Wishing Well to play for Lucky Coin stakes (equivalent to §1500 Buy-In) to increase your odds of hitting a big jackpot!